While surface features and low resolution bathymetry had led many workers to suspect the presence of large landslides around the Hawaiian Islands, it wasn't until the Gloria Sonar mapping by the USGS in the late 1980's that the actual extent of these slides was documented. This map shows the distribution of the landslides, which occur around all of the major islands. The number of slides and their extent surprised everyone working on the project. These slides rank among the world's largest landslides. This should really not come as a surprise since the islands really are built on a foundation of "watermelons and marbles" (pillow lava and sand) that rises 15,000-20,000 feet above the surrounding seafloor. These vertical drops are about as big as you kind find on the planet. The slides come in two basic varieties, just like those on the Big Island. There are a number of slumps, but debris avalanches are far more common. Some of the slides, like the Pololu slide off of Kohala volcano have yet to be fully documented. More recent work suggests that this slide may be a much smaller slump rather than a large debris avalanche. Others like the South Kauai slide also appear to be more complex. A large amount of the island of Niihau is missing and is probably in this slide mass. The largest of the slides are found off of Oahu and Molokai. The east and north sides of these islands are cut in a nearly straight line, reflecting the loss of a vast amount of the constructional volcanic edifice. The run out of the slides is around 200 kilometers, making them some of the largest on the Earth. The slides are composed of huge blocks that can be clearly seen on this USGS Gloria sonar image. Not only did these slides travel a great distance from the islands, but they actually ran up the Hawaiian Arch! The NASA space shuttle photo of Molokai and Lanai shows the razor sharp north side of Molokai versus the rounded shape of the south side, a remnant of the old shield. 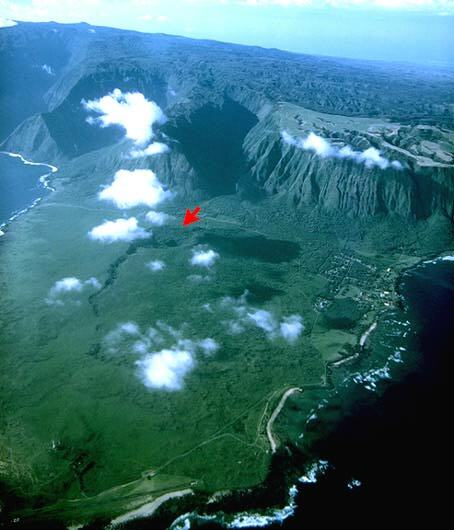 The most heavily eroded and highest part of the island is the old caldera of East Molokai volcano. Robin Holcomb worked extensively to demonstrate this area is filled in by flat ponded lavas (in the caldera) that are younger and have different paleomagnetic signatures than the outwardly tilted lavas on the south side. Robin was one of the first people to speculate that the caldera was destroyed by a large landslide and has done a lot of the work to prove this theory. Th drawing above by Rick Hazlett shows a rough evolution of the north side of Molokai. Here the slide headwall is depicted as the current coast, which has been modified slightly by erosion. The Kalapapa Penninsula is a late eruption of post erosional basalt that formed well after the slide itself. In 1998, Dave Clague of the Monterey Bay Aquarium Research Institute ran really high resolution sonar mapping surveys of the north side of Molokai. These revealed a distinct slope offshore of Molokai, indicating that the cliffs on the north side of the island don't really represent the slide scar. Instead they probably are formed by erosional headwall retreat of the scar. If you look real closely at this image you can see a meandering stream that is now below sealevel (and no longer a stream) due to subsidence of the island. The real landslide scar is represented by the steep offshore slopes. 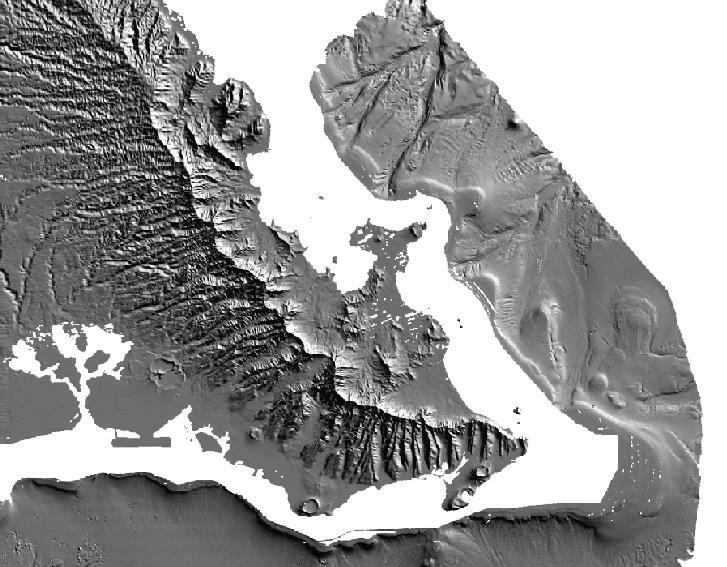 Another view of the topography and also of the Kalapapa pennisula are shown below. The Kalapapa pennisula is built on the submerged erosional topography. Oahu has a similar sharp eastern escarpment, very similar to the north side of Molokai. On Oahu, in the area around Kaneohe Bay the retreat of the mountain front and the development of a flat coastal plain is much clearer than on Molokai. This type of topography is also very pronounced on the east and south sides of Kauai. The flat area around Kaneohe Bay is the old caldera of the Koolau volcano, whose rift zone ran in the same direction as the present day Koolau Range. The area around Kaneohe Bay is laced with dikes cutting flat lying basalts, an indication that this was the old caldera. 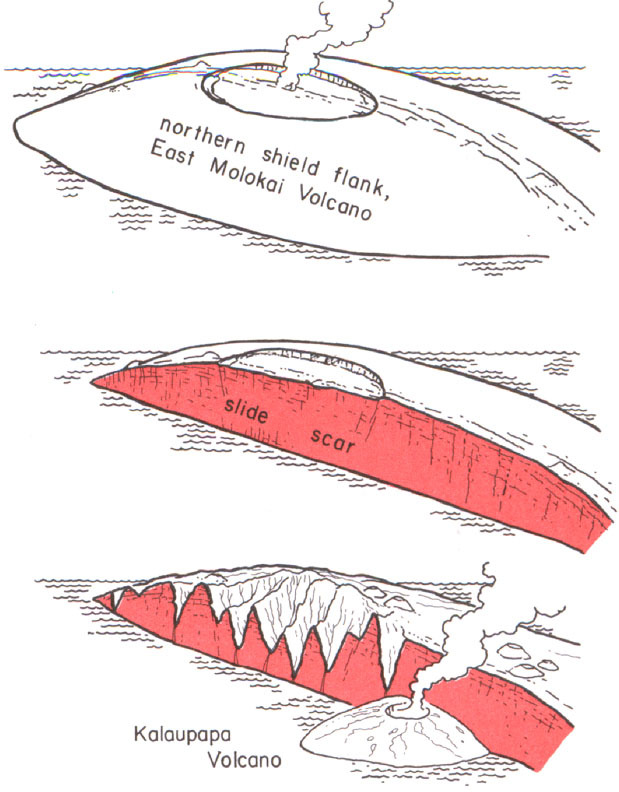 The topographic evolution of the Koolau volcano is shown in this drawing by Rick Hazlett. This offshore image clearly shows that the slide scarp is well offshore of the present day island, very much like the situation on Molokai. Although some workers believe that the slides may have calved the calderas of the volcanoes in half, it is also possible that they truncated much later by normal headwall erosion. It is interesting to ponder what might have happened if the slides did occur when the volcanoes were active and they did remove a portion of the active caldera area. Under Destruction--Well literally. If we look at the offshore profile of Kohala volcano, you can see that it is more of a slump structure than the total failure that it was originally surmised to be. The old pancake volcanoes in the lower left are rotated back toward the volcano during slumping. Also notice the steep scarps on the left side of the image. These are the submerged shorelines of Kohala (deepest) and Mauna Kea volcanoes (shallower). Also notice the submarine stream erosion coming from Wapio-Waimanu-Pololu valleys. What's up with this? How can streams flow underwater? We're not absolutely sure about this, but it appears that dense, cold water, which may be sediment laden, is flowing as currents and eroding the flank of the volcano. The answer to this will have to await submersible dives. What are the two principal types of landslides on the Hawaiian Islands and what are likely causes of these differences? How do landslides help shape the Hawaiian Islands? What effect might landslides have on calculations of past lava production rates? Moore, J. G. and others, 1989, Prodigious submarine landslides on the Hawaiian Ridge: Journal of Geophysical Research, Series B 12, Volume 94, p. 17,465-17,484.